Not a food maxim to follow, generally, despite Iron Chef’s emphasis on plating. But this time it proved true, and I learned a lesson about second chances. It was not long ago that Philipe lured me into eating his so-called Southwest Chicken Gourmet Sandwich, which I ultimately regretted for several reasons. 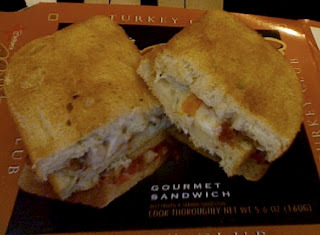 Still, being a glutton for both punishment and sandwiches, I recently tried Philipe’s other Walgreens panini: the Turkey Club Gourmet Sandwich. One look, and you'll know it's not a club sandwich. One bite, and you’ll know turkey is not prominently featured beyond its name. Despite these setbacks, this sandy exceeded my expectations. 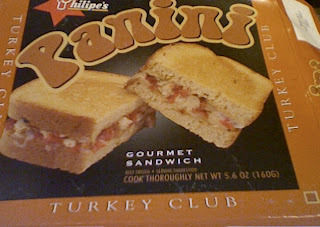 One of my main complaints about my first Philipe panini purchase was that the photo on the box failed to look anything like the product within. Usually this kind of deception comes with a disclaimer explaining the need for some assembly, or a statement explaining that the elaborate spread on the box is merely a “serving suggestion” assuming you plan to gussy up your frozen meal with an array of garnishes. This time, I knew better, and guessed some assembly might help. Instead of treating the panini like two open-faced sandwiches, I cleverly pressed them together and sliced the result in half. And lo, it did in fact look like the sandy on the box. It seems what I had originally attributed to false advertising was my own fault. In the computer world, this is called user error. In my defense, the back of the box’s extensive instructions said nothing about putting the sandwich together. But I still owe an apology. Phillipe: I am sorry. Correctly assembled, the sandwich was far more satisfying. I felt like I was eating a proper sandy and not some bush league bruschetta. Lest I mislead, the sandwich still sucked. Less so than the southwestern panini, but it certainly wasn’t good. The oddly extensive variety of tiny diced bits of meat left an unpleasantly oily and salty aura in my mouth, as did the unidentifiable cheese blend. On the plus side, the bread toasted up nicely thanks to the package's magic silver grilling platform. I can’t pinpoint the extent to which the assembly affected my judgment, as this panini tasted awfully similar to the last one, but the Turkey Club was undeniably one half sandy better than the Southwest. Kudos, Philipe — you have raised my respect (ever so slightly) for your sandwich operation, Walgreens and the French.